Today is Election Day here in America. As citizens, it is our highest right and honor to vote. I often think of what Thomas Jefferson said. He was a man who achieved everything a man could achieve here in America. He wrote the Declaration of Independence, was a diplomat, Secretary of State, Vice President, and President. And he said that when he died, all he wanted on his tombstone was Thomas Jefferson – Citizen. Because, he felt like, there was no greater title to have. Citizen. Today, we are citizens. Augustine wrote about our citizenship in his book the City of God. He said that as Christians, we are citizens of two cities. The city of God, our heavenly home, and the city of Man, our earthly one. And, our responsibility as part of the city of Man is to work to make it the best it can possibly be. We should not forsake or forget our duties. Too many people have given too much for us to not take this vote seriously. Today, vote. But, remember 2 things. First, no matter how the election turns out, if your guy wins or loses, remember. 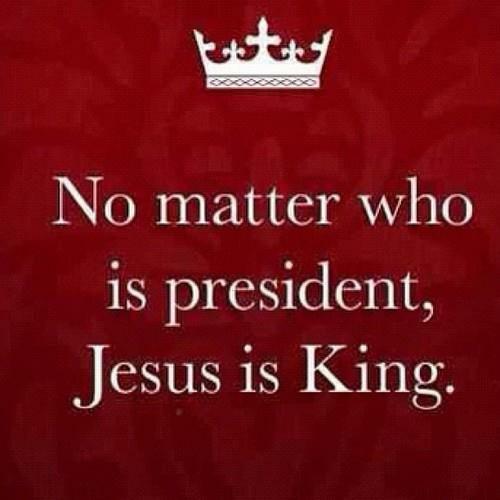 Jesus is King. Remember that. Second, I want to share some words that John Wesley wrote to his followers during an election in England. From John Wesley, October 6, 1774. Because as Christians, we are to love. Everyone. Even “them.” Whoever “they” are. Because you know what? Christ died for “them” too. So today, please go vote. Do you duty as an American citizen. But, love everyone. Do you duty as a Christian.